The Microsoft Startup Accelerator Program is designed to help high potential software startups around the globe get access, guidance and support to accelerate their success on the Microsoft platform. Selected participants receive customized engagement plans to support their software and market development efforts. Accelerator companies are selected to join the program based on their innovation, high growth potential, funding, platform decision and strategic importance to Microsoft. At this time, they are no longer accepting new applications as they have reached full capacity, but they are encouraging us to check back in September. At the Latest Blogs From The Emerging Business Team, there are three most interesting recent articles that it’s worth reading: Gaming -- The Next Generation Moves On, The Promise of Serious Games and Microsoft’s New Surface Makes Its Entertainment Debut In Vegas. Under the topic Ho Ho Ho. Microsoft Gets Social — Our Game Plan for a Connected Entertainment Experience (Gaming -- The Next Generation Moves On), Dan'l Lewin, Corporate VP, Strategic and Emerging Business Development, describes how entertainment is becoming a shared, connected, social experience. In fact, he envisions a time when all gaming and entertainment services will be connected. Imagine this scenario: A gamer starts a connected game on her Xbox at home, continues it on the cell phone in the cab on the way to the airport, and finishes it up on the plane by plugging into the armrest. It’s increasingly about a social experience — and it’s not just male-dominated anymore. This vision would also suit beautifully "Serious Games" proposition when bringing gaming environment into the workplace where Yi-Jian Ngo (The Promise of Serious Games), believes the greatest potential lies in immersive & intuitive user interfaces. In Microsoft’s New Surface Makes Its Entertainment Debut In Vegas, Anne-Marie Roussel, Connected Entertainment, who manages the Entertainment portfolio (Zune, Video, Xbox), covers what is happening to Microsoft’s newest interactive table, Surface. Six of these Surface tables are now installed at the iBar ultra-lounge located at the Rio All-Suite Hotel & Casino in Las Vegas. It enables bar customers to order drinks, watch YouTube videos, play touch-screen games and even flirt with each other. 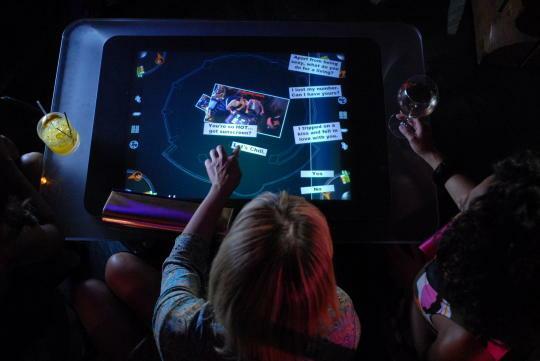 The Microsoft Surface team custom-built the apps for the Rio’s bar—the hotel belongs to the Harrah’s group, which is one of a handful of hospitality companies that was targeted by Microsoft for initial launch of Surface. Harrah's is the first to install Surface in an entertainment venue. A program called Mixologists enables customers to play bartender by creating and ordering mixtures of whatever cocktails they click on. The system is able to remember users' drink orders and, one day, may be able to offer customers the same drink at other Harrah's locations, such as when they play a slot machine. The table also includes a program called Flirt—aptly named as it enables customers sitting at any of the six Surface tables in the iBar lounge to chat with each other, take and e-mail pictures and even trade cell numbers. Other programs let users play video games or get information about restaurants, shows, nightclubs and other Harrah's attractions. For those who haven’t see the cool demos by Bill Gates when Surface was launched, here is how it works: Surface is a rectangular, coffee-table type with a built-in 30-inch flat screen. 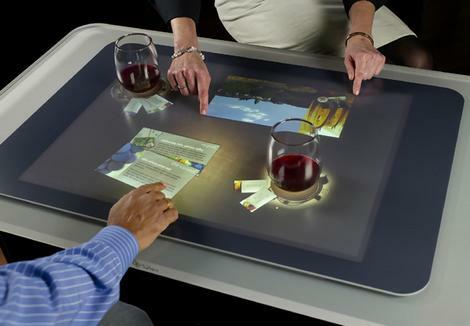 The touch-screen technology uses a camera behind the screen to detect hand movements, which become visible to the camera like silhouettes once users press their fingers on the table. The screen displays high resolution images—the graphics are very compelling. Outside the entertainment world, Surface can also be seen since April in some AT&T wireless stores. There, they are programmed to recognize eight mobile handset types and give information about their features. More retail and hospitality sightings to be announced soon.